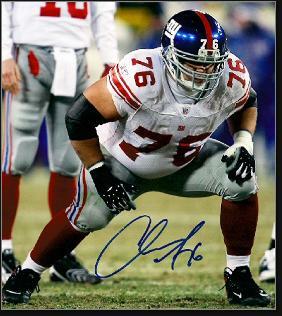 Christopher Snee was born January 18, 1982 in Edison. He was one of four sons born to Diane and Ed Snee. His family moved to the small town of Montrose in northeastern Pennsylvania when he was a boy. Quick and muscular, Chris was a monster in youth league football and continued to dominate opponents as a pass rusher for the Montrose High Meteors. After earning a starting job, he led the team to district titles as a sophomore and junior, and was named All-State as a junior and senior. He was the regional Defensive Player of the Year as a senior in 1999. Although he would eventually tip the scales at over 300 pounds as a pro, Chris was also the star of the Montrose High hoops team, earning All-Conference honors in 1999 and 2000. Chris accepted a scholarship from Boston College, where he was shifted to the offensive line. After red-shirting his first year, he was a Third-Team Freshman All-American in 2001, starting at guard for most of the season. He continued to excel at this position, and as All-Big East and Second-Team All-American as a senior in 2003. Chris projected as a high pick in the 2004 NFL Draft, so he decided to forgo his final year of college eligibility. The New York Giants took him with their second pick. The selection went practically unnoticed because of the team’s maneuvering in the first round. Philip Rivers was the #1 pick, and he was dealt immediately to the Chargers, who had taken Eli Manning first overall. He won the starting job at right guard as a rookie, but missed the final six games because of a gland issue that did not respond to treatment. Chris played the full season in 2005 and 2006, and was recognized around the league for his exceptional run and pass blocking. He continued to excel in 2007, helping the team win the Super Bowl. In 2008, Chris turned in his first Pro Bowl season. After the final regular season game, he married Kate Coughlin, the daughter of coach Tom Coughlin. Chris continued to anchor New York’s offensive line through the 2012 season, after which he earned his fourth Pro Bowl start in five years. Chris earned All-Pro honors in 2008, 2009 and 2010, and played well during the Giants victory in Super Bowl XLVI after the 2011 season. Chris was injured for much of 2013, starting just three games because of an injured hip. He had already undergone hip surgery on the opposite side after the 2013 Pro Bowl. At the start of training camp in 2014, Chris announced his retirement.